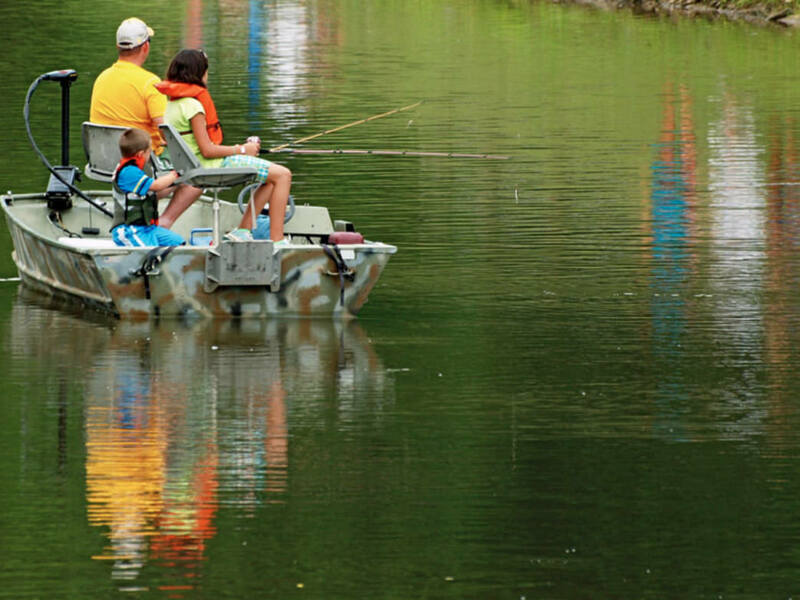 Only electric boats are allowed at Mountwood Park's lake, allowing for an undisrupted fishing experience. Mountwood Park near Parkersburg, WV, has more than 50 miles of trails and a 50-acre lake, with plenty of space for activities from horseback riding to disc golf to mountain biking, and of course, fishing. In fact, the lake here happens to be where the state record tiger musky was caught, so there is definitely a chance for catching a big one here! There’s a dog park, picnic areas, concessions, and overnight accommodations, including primitive campsites, horse camps, cabins, and a lakeside house if you want to make a weekend of it. Mountwood Park is both a day-use and overnight destination, with an outdoor playground for the whole family, including your furry friends. Since it’s just off West Virginia’s Route 50, Mountwood Park is an easily accessible, well-maintained park with family-friendly events throughout the year. It’s taken care of by several area organizations, including Friends of Mountwood Park. There are also local clubs for people who love birdwatching, horseback riding, running and even flywheelers. Because the community is so involved in Mountwood Park’s well being, several people use it throughout the year. The park’s 50-acre warmwater lake is great for fishing year round, and is stocked each winter by the West Virginia Department of Natural Resources (WVDNR). The WVDNR stocks the lake with rainbow, golden, and brook trout from January through April, and with channel catfish annually. The lake also has a good bluegill and largemouth bass population, so no matter what you’re looking to catch, you can most likely find it here. When it comes to fishing, Mountwood Park’s lake doesn’t just have quantity, but quality as well. It’s big claim to fame is a 36.5-pound, 49-inch long tiger musky that angler Clyde Beckett reeled in in 1994. Another cool activity for you to check out is the park’s annual Moon Over Mountwood Fishing Festival each June. 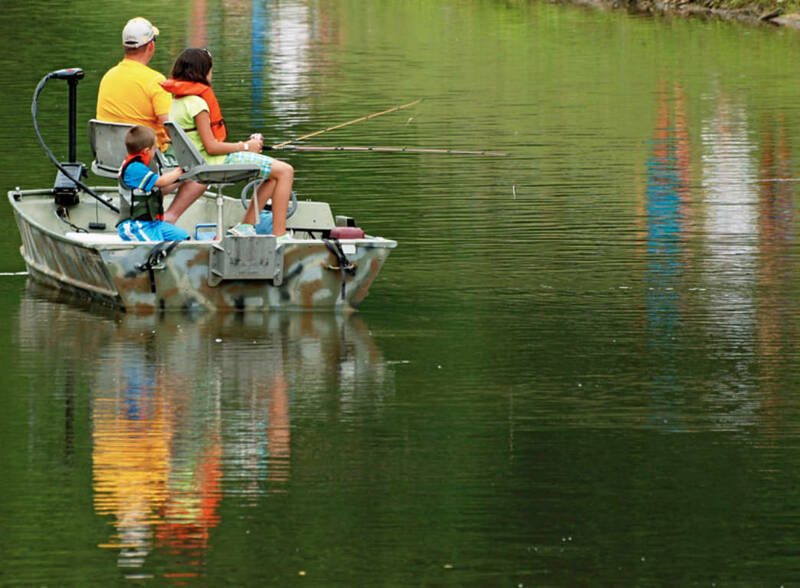 The derby is an outing for the entire family, and has free fishing for kiddos below the age of 6 and all-night fishing for the adults. Kids fish first on Friday afternoon, and adults get their turn Friday evening into the wee hours of Saturday morning. There are awards for the longest fish in each division, but every registered child gets an award. Mountwood Park is well suited for all kinds of outings and gatherings, from day trips to enjoy its nature trails to weekend camping trips. Beginners, children, entire families, and avid fishermen alike can enjoy fishing at Mountwood Park Lake. Because the lake is stocked with some species and a natural habitat for several others, there’s an abundance of fish here year round. It’s as much of a destination in the winter as it is in the summer, so the park has plenty of opportunities for seasonal anglers. Gas motor boats aren’t allowed at Mountwood Park Lake. Anglers can fish from the banks or from electric motor boats, but you don’t have to worry about gas motors disrupting your fishing time. The park is in Waverly, WV along U.S. Route 50, just 12 miles from nearby Parkersburg. The main entrance is at 1014 Volcano Road in Waverly, near Deerwalk. A WV fishing license is required and all state rules and regulations apply.